Tonight the Chicago Bulls (18-18) come face-to-face with the Atlantic Division leading Toronto Raptors (24-11) in the first of three meetings scheduled for this season. Last year Chicago swept the season series, and in fact come into tonight on a nine-game winning streak over the Raptors dating back to December 31, 2013. Tonight will also be the first of a back-to-back set of games for Toronto, as they will return home later this evening in order to take on the Houston Rockets Sunday at the Air Canada Centre. The Bulls get Sunday off, but will back in action Monday when Russell Westbrook and the Oklahoma City Thunder roll into town. So far this season the Bulls have achieved a great deal of success whenever they charge out of the blocks and play fast right from the start. Therefore, in order to come out on top tonight against one of the top teams in the entire league, Chicago will have to show up to work ready to run with a gritty mindset. Another primary factor as to whether or not Chicago will have a good night is how they do on the glass. The Bulls currently lead the league in rebounding with an average of 47.5 per game, while Toronto comes in sitting near the bottom at No. 22 with a mark of 42.7. The Bulls are also at the very top of the NBA when it comes to offensive boarding with a league-best 13.7 average. The Raptors, however, aren’t too far behind in that category at 11.3 per game, which is tied for 7th. Toronto starting center, Jonas Valanciunas, a 5th-year, 7-footer out of Lithuania, is a major reason the Raps are strong on the offensive glass. Valanciunas recorded a team-leading 13th double/double last time out against Utah with 18 points and a team-high 13 rebounds (8 offensive). Toronto is 13-4 this season whenever he collects double-digit boards, so keeping the 24-year old goliath in check down low will have to be a high priority for Chicago. A happy circumstance of being a strong rebounding team, especially on the offensive window, is that your team is able to score easy baskets on put-backs. The Bulls, in particular, have taken full advantage of this aspect as they enter tonight leading the NBA in second-chance scoring with a mark of 16.3 second-helpers per game. Chicago is not a particularly good outside shooting team, thus being able to cash-in on put-back opportunities has help them win a number of games this season. Chicago is 16-10 whenever they outrebound an opponent, 15-11 when they outscore them in second-chance points, and 13-3 when they hold foes to under 100 points. Outside of Golden State’s starting backcourt of Steph Curry and Klay Thompson, you would be hard pressed to come up with another guard duo in the league that’s more dynamic than Toronto’s Kyle Lowry (22.5 points, 7.0 assists, 4.9 rebounds, 1.5 steals and 44.5% 3FG) and DeMar DeRozen (27.4 points, 3.9 assists, 5.1 rebounds and 1.3 steals). No breaking news here — Chicago’s backcourt will most certainly have their hands full tonight. The 6-foot Lowry ranks third in the NBA in 3-pointers made (118) and is sixth in 3-point shooting percentage. He has scored 20-or-more points in seven of his last eight games, and averaging 27.1 points over this stretch. DeRozen is no picnic either, as he currently ranks sixth in the league in scoring (27.3), and recently became the franchise’s all-time leading point-getter on December 28th, blowing by Chris Bosh’s 10,275 points. The 6’7” shooting guard now in his eighth season has posted a grand total of 10,394 twine-ticklers in a Raptors uniform, with no end in sight. So far DeRozen has put up 30-or-more points 16 times this season, and 20-or-more in seven straight games, averaging 25.3 points during this particular stretch. Offensively, the Bulls have proven to be at their best when they aggressively push the ball up the floor and keep it hopping it from player-to-player and from side-to-side. For Chicago to click, the ball has to skip freely and not end up glued onto anyone’s hands for too long. 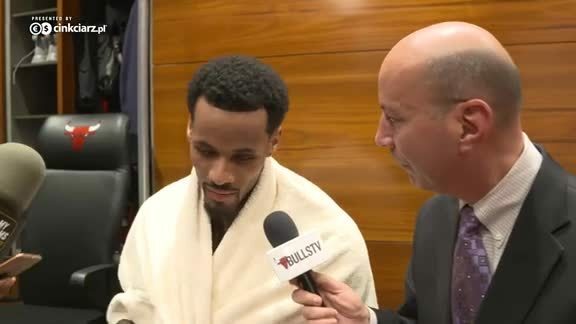 Every Bulls player on the floor needs to be active and fully engaged as to what’s going on. Although entertaining, standing around and watching Jimmy Butler or Dwyane Wade go one-on-one just won’t cut it tonight. Without a doubt, the Bulls are going to need to spread out and space the floor while also looking to regularly attack the rim, forcing Toronto to react and hopefully foul. As a team, Chicago has done an outstanding job of getting fouled and making it to the free throw line this season, as they’ve outscored opponents 693-509 at the charity stripe. To break it down further, the Bulls have posted 20 or more charity tosses 20 times this season which is the most in the NBA. Over their last five games, Chicago is averaging a league-best 24 made free throws per night. It also helps that the Bulls are one of the top free-throw shooting teams in the league (80.3%). Jimmy Butler, in particular, has done an amazing job of drawing fouls and getting to the line this year. Not only is the two-time NBA All-Star and recent Olympic Gold Medalist averaging a career-best 25.2 points, but he is 3rd in the league in free-throws made (8.5), fourth in free-throw attempts (9.5), and is converting at a career-best 88.0% from the line. In short, Chicago’s mission tonight is to come out fast and strong at both ends of the floor and never slow down. From the opening tip to the final buzzer, the Bulls have carry a chip on their shoulder and be tenacious in every phase of the game. They have to wrestle control of the boards — both offensive and defensive —and not allow Toronto too many opportunities to run out on the break for easy scores. 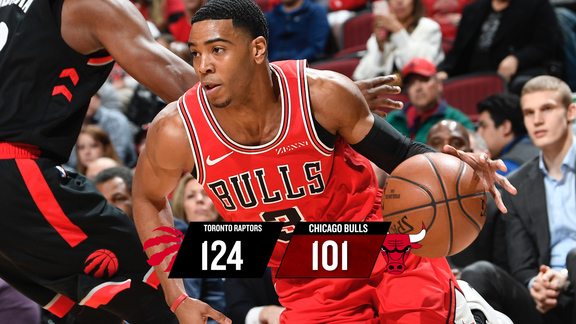 It is also vital for the Bulls to aggressively defend the 3-point arc as Toronto ranks 3rd in the NBA in 3-point shooting (38.9%) and averages 9.5 made treys a game. Therefore paying close attention to and aggressively running shooters off the arc tonight will have to be a main priority for Chicago. Every pass and every shot Toronto attempts has to be challenged. The Bulls are on a nice roll of late having won two games in a row after defeating Charlotte at the UC Monday and then going on the road and knocking off the defending NBA Champs, the Cleveland Cavaliers Wednesday. To keep the good vibes flowing Chicago simply can’t afford a let-up this evening. Something to keep in the back of your mind while watching tonight’s game — Toronto is 19-0 this season when leading after three quarters. They also own an NBA-best +4.5 point differential in the fourth quarter and rank 2nd in the league in fourth quarter scoring overall with an average 28.8 points. In fact 18 times this season they have scored 30-or-more points during the game’s final 12 minutes. In order to counter all these traits, the Bulls need to effectively and efficiently execute their game plan. They need to show up with more energy, focus and fire throughout all four quarters (and overtime, if necessary) in order to walk off the hardwood tonight with another impressive victory under their belt.